The Liquiline Compact CM82 from Endress+Hauser is the right transmitter where space is restricted in production. Its housing is so slender, that it fits, together with the sensor, into almost every assembly. Although it is so small, it is packed full of the latest transmitter technology and can be operated via Bluetooth from any iOS or Android device. Using the app, you can see all the measuring points within the Bluetooth range of your tablet and smartphone. Configuration and diagnosis can also be performed conveniently using the SmartBlue app. Incidentally, the Bluetooth connection is uniquely secure against unauthorized access by third parties, as confirmed by the German Fraunhofer Institute for Applied and Integrated Security (AISEC). The Liquiline Compact CM82 is compatible with all the transmitters, analyzers and samplers from the Liquiline platform. 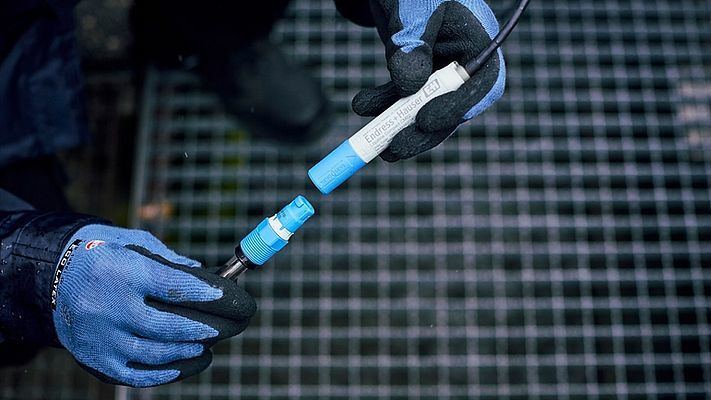 This means that you can use sensors of the same type at all measuring points: all pH, ORP, conductivity and oxygen sensors with the blue Memosens plug-in head can be connected. This allows you to make use of the numerous benefits that Memosens technology has to offer, including 100% reliable data transmission and true plug and play with pre-calibrated sensors. As a loop-powered two-wire device, the CM82 can be connected directly to a programmable logic controller (PLC), which also serves as the power supply, thus eliminating the need for a power cable. A cable for the sensor connection is also not necessary, since the sensor is plugged directly into the transmitter. As a result, you have a measuring point whose space requirement could hardly be lower and where the wiring effort is minimal. If you parameterize a CM82 measuring point, all settings are saved in the device. In the case of a sensor exchange, the transmitter - and thus the measuring point configuration - always stays on-site. A new parameterization is not necessary. In addition, the CM82 reads all sensor and calibration data stored in the head of a Memosens sensor. As a result, the sensor is automatically detected within seconds and your measurement is immediately ready for use after a sensor change.